​"This thing could blow up in our faces at any moment." "Dobbs skilfully tells [this] fascinating and timely story." --The Washington Post. "One of the greatest stories of our time. Michael Dobbs' superb research and exceptional writing add to the drama." --Providence Journal. 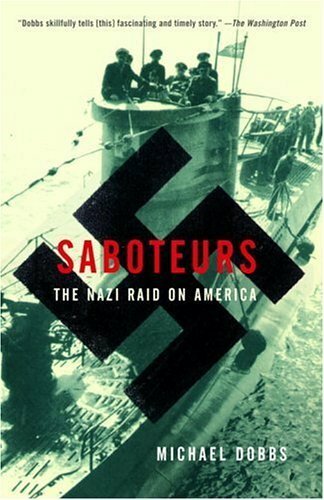 "Saboteurs is a riveting detective story within an engrossing war story. Meticulously researched and elegantly written, this book is that wonderfully rare thing: a first-rate work of history that is impossible to put down." --Rick Atkinson, author of An Army at Dawn. "Dobbs delves, incisively, into the mindset of the different participants, with their conflicting back stories, agendas and loyalties, to midlevel FBI operatives, to the legal minds summoned to work the cases...Dobbs fully evokes the relentless pace familiar to readers of traditional thrillers." -- Houston Chronicle. "Fascinating...must-reading for true crime and world War II enthusiasts. Highly recommended." -- Tucson Citizen. "Dobbs seasons his story with just the right amount of wryness, letting the farce play out and keeping the details tidy...An entertaining and useful book." -- San Jose Mercury News. "Hair-raising...intricately crafted...a first-rate thriller [that] is much more exciting for being true." -- Winston-Salem Journal.